The Liberal Democrats' election manifesto promises that the party will restrict the broadcast of "junk food" advertising before 9pm, complete the introduction of plain cigarette packaging, clamp down on e-cigarette advertising and "encourage the traffic light system" for food products, should the party gain power post-7 May. Compared with Labour’s and the Conservative’s manifestos, the Lib Dem document - which promises to give "heart to a Conservative" coalition and "brain to a Labour" one - goes into more detail regarding plans affecting marketers and brands, but covers similar ground in terms of healthy eating and smoking. In the ‘Helping people keep healthy’ section, the Lib Dems said they would do more to promote healthy eating and exercise, including continuing the ‘5 A Day’ campaign. The 138-page manifesto also said that the party would "carefully monitor the growing evidence around electronic cigarettes", which it admitted appear to be "a route by which many people are quitting tobacco", ensuring that there are marketing restrictions on advertising of such products. But the Lib Dems insisted they would rule out a statutory ban on ‘vaping’ in public. Tobacco companies would also be forced to pay a levy, "so they fairly contribute to the costs of health care and smoking cessation services". The Lib Dems said they would introduce minimum unit pricing for alcohol, "subject to the outcome of the legal challenge in Scotland". 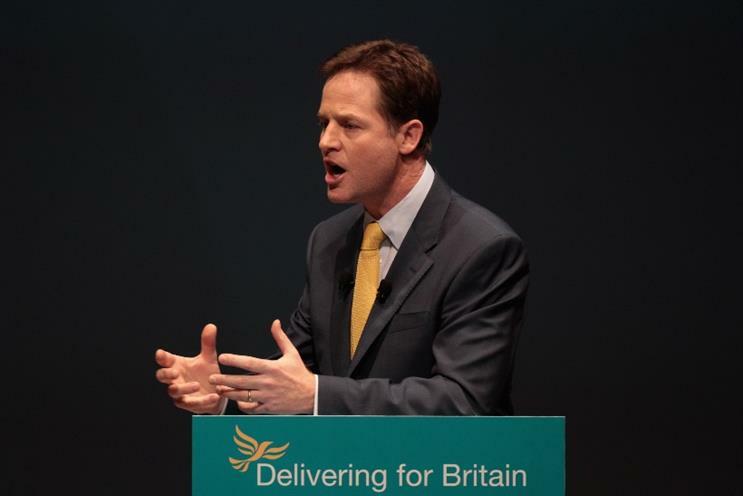 Lib Dem leader and deputy prime minister Nick Clegg used the foreword in the manifesto to take a swipe at the Tories’ plans for an in-or-out EU referendum, as well as SNP hopes for independence. He wrote: "In our fast-changing world, the fundamental question political parties face is: do we want to continue to be an open society, confident and optimistic about our place in the world, or do we want to become a closed one, increasingly insular and backward-looking? "For Liberal Democrats there is only ever one answer: we want an optimistic, open-hearted and outward-looking United Kingdom."